One of the reasons I love the Christmas holiday is the traditions. 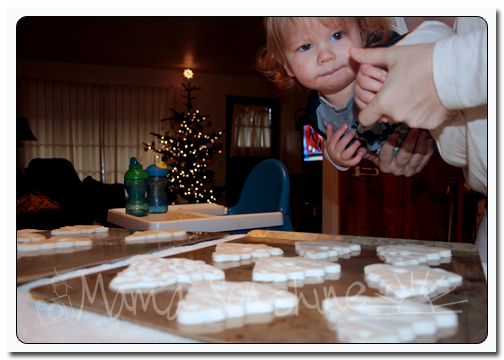 I love reviving old family traditions, and making new ones. I love remembering fondly the things that I did as a child at Christmas time and the things I couldn’t wait to do again. As an adult, I get to make sure our family participates in our traditions and make new ones. 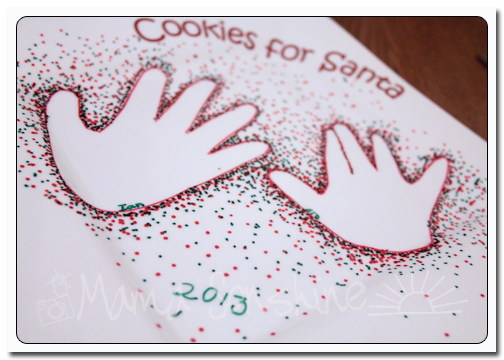 It is no secret I love hand and foot print art. Last year we made these Mistletoes plates. We gave them to some family as gifts. I had thought we might make them again, but decided I wanted to do something different. 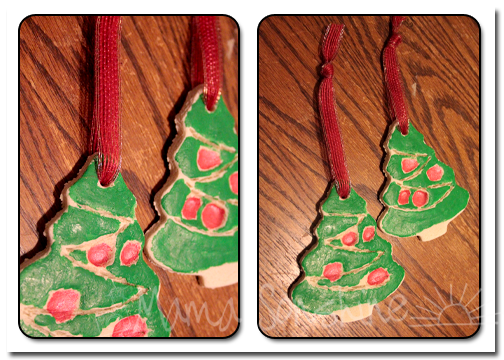 We made salt dough ornaments with the kids fingerprints to give to family. OK, admittedly, I am not as pleased with them as I was with the plates. Mostly because you can’t tell the difference between Ian’s & Sid’s thumb prints. They are really easy, and I could make a lot of them all at once. Ian is much more cooperative with these projects than Sid is. So I needed something that I could quickly make a lot. Mix salt and flour together, add water a little at a time until a dough if formed. 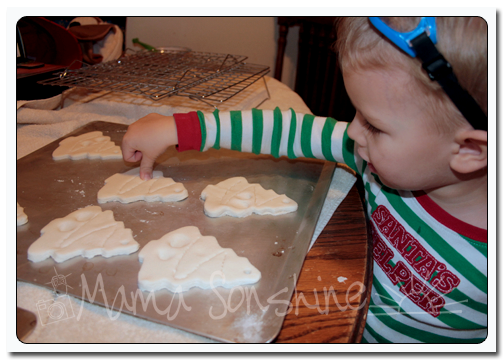 If using food coloring to color ornaments add to water prior to mixing with four & salt. Knead until dough becomes elastic, smooth and stickiness is gone, adding little bits of flour as needed. Roll out dough to 1/4″ thick on a greased surface. 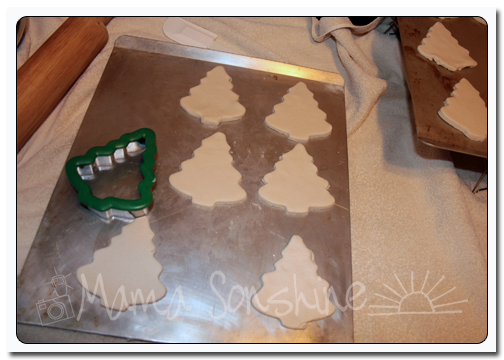 Use Christmas tree cookie cutter to cut out ornaments, I was able to make about 15. Poke a hole for the ribbon at the top of the tree. 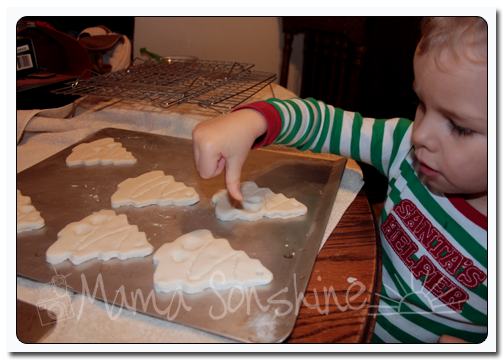 Have kids use finger/thumb prints to make ornaments on the cut out trees. This is a good assembly line project. Ian just went through and put two prints on each one. I did have to tell him not to put them on the edge. Little guys might need some help or persuading to get their thumbs on there. Sid was not very enthusiastic about this. Place on a greased cookie sheet and bake for 2 hours. 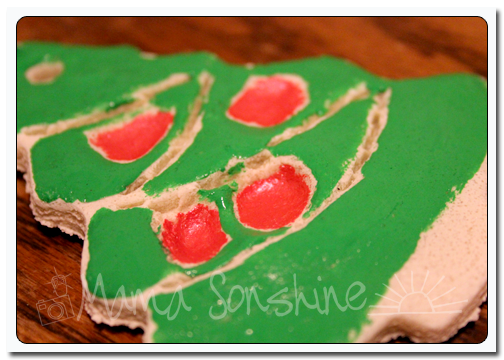 Remove from oven and allow to completely cool before painting. I used whatever craft paint I had on hand. One was acrylic and one was enamel, both worked fine. Thread a length of ribbon through the hole and tie in order to hang up. There is no ornament on a tree better than the ones your children make. At least, according to me. Categories: Christmas, Holidays, Homemaking, Parenting, pictures, She's Crafty, Toddler Life | Tags: 12 Day of Christmas Tradition, Children, Christmas, Christmas and holiday season, Christmas Crafts, Christmas holiday, Christmas ornament, Christmas tree cookie cutter, Christmas Tree Fingerprint, Family, Family traditions, Fingerprint Ornaments, Fingerprint Tree Ornaments, Hand Made Ornaments, Hand Print Art, Holiday, How to make Salt dough, Motherhood, Photos, Salt dough, Salt Dough Ornaments, Salt Dough recipe, Tradition | Permalink. It is so much fun to make things with the kids, but this craft is made by me with the use of the kids hands. On Christmas Eve I realized I didn’t have a plate for Santa’s Cookies! I tried to find on at the store and couldn’t find one I liked, and decided to make my own. I know, make a plate on Christmas Eve, was I crazy? I had seen this post around thanksgiving and thought it was great and knew I wanted to make something in that style. Clean your plate with rubbing alcohol before use. Trace you child(ren)’s hand on the sticker, then cut out. 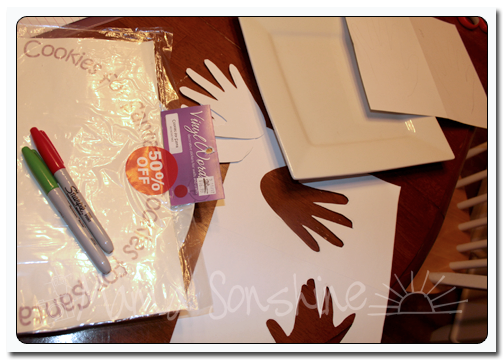 I used large address labels, but they didn’t work that well, contact paper would be better. The address labels have too much adhesive and were really hard to remove. 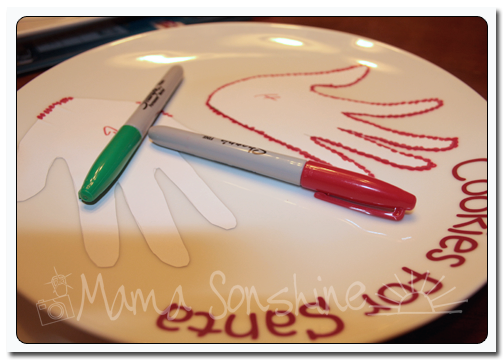 Place the pattern on the plate and using the sharpies, start your dots. Dot heavily around the pattern, and tapering out as you go towards the plate edge. Since I had two hands, I kept the heavy pattern in between the hands. On the first plate I did, I dotted around the pattern, which took a long time. 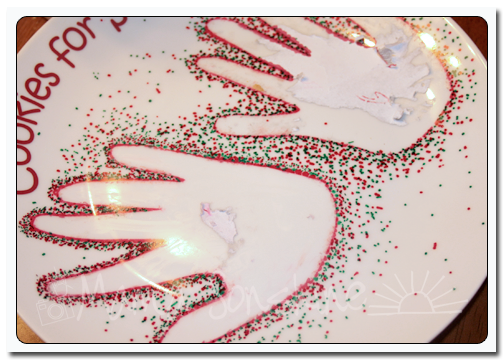 I thought if I could remove the address label quickly it would be easier, so I traced around the hands before dotting. I was able to cleanly remove the address label, but I didn’t like the look as much. It is also better if you don’t use a brand new sharpie, you want the point to be blunt for better dots. When you get the look you want you need to cure it. If there is a mistake you can probably clean it up with some rubbing alcohol and a cotton swab. Place your plate in a cold oven and turn it on to 350°. Bake for 30 minutes, turn off oven and let the plate cool while still in the oven. You can spray with a clear sealing spray if you want, but I can’t guarantee it would be food safe. I would recommend hand washing only. 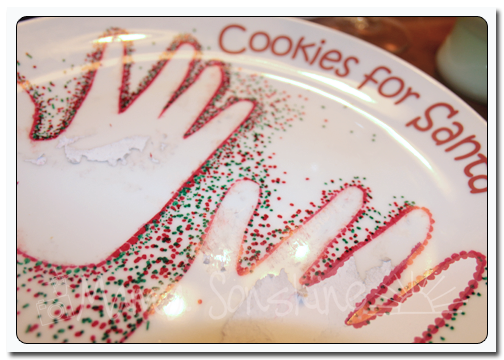 I used vinyl stickers for the “Cookies for Santa” on the plate. I had planned on writing “from our hands to your” but didn’t think there was room. Categories: Christmas, Holidays, Homemaking, Parenting, pictures, She's Crafty, Toddler Life | Tags: 12 Day of Christmas Tradition, Children, Christmas, Christmas and holiday season, Christmas Crafts, Christmas Eve, Christmas Jammies, Cookie Plate, Family, Family traditions, Hand Print Art, Holiday, Motherhood, Photos, Santa Cookies, Santa Cookies Plate, Santa Plate, Sharpie Dot Art, Sharpie Dot Plate, Sharpie Plate, Tradition | Permalink. Christmas art work. Okay, so it is not a tradition yet. This is our first year, but I plan to make it a tradition. Ian isn’t as much into painting, coloring or drawing as some kids I know. He is too busy to sit down for that long. So when he does I like to make sure I capture it on film. While at the craft store one day he found this wooden snowflake and ceramic snowman he wanted. My mom bought them for him and she let him paint them at her house. Ian really likes to mix all his colors together in the painters tray before using them. Such lovely artwork. Categories: Christmas, Holidays, She's Crafty | Tags: 12 Days of Christmas Tradition, Children Crafts, Christmas, Christmas and holiday season, Christmas Crafts, Christmas ornament, Christmas Tradition | Permalink.